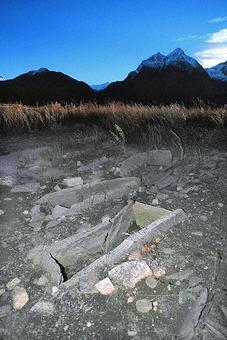 This prehistoric cemetery, located on a rocky knoll facing the central part of Val d'Aosta, was discovered in 1968. Several excavations made between the discovery and 1994 have found 66 tombs, along with ceramic and stone artefacts. The burial ground area measures about 20 x 30 metres (about 65 x 100 feet) and some of the tombs were used for more than one burial. Almost all the tombs are aligned N/S or NE/SW and are composed of a rectangular stone chamber, often surrounded by a belt of smaller rocks. The human remains inside the tombs were usually found crouched up on their left sides, with their heads to the S or SW. Two of the tombs contained pairs of skeletons stretched out and placed side by side; inside one of these tombs, some seashell bracelets have been found. Carbon-14 measurements dated the burials to about 1250 BC. It is worth mentioning that on the northern side of the cemetery there is a group of rock carvings and two prehistoric rubbish dumps.